1. How to Tell the Difference Between a Leprechaun and a Clurichaun. Everyone’s heard of leprechauns. They’re the wee folk that make shoes and guard pots of gold at the end of rainbows. They wear green, grant wishes, and are associated with luck. But what about clurichauns? Ever heard of them? (Truth be known, I hadn’t). Apparently, leprechauns have a dark side. 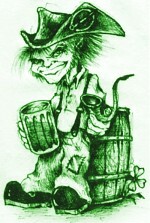 If leprechauns are Dr. Jekyll, then clurichauns are Mr. Hyde. As with the legendary literary figure, there’s some controversy regarding whether clurichauns and leprechauns are one and the same or two different creatures. Cryptid Creatures calls clurichauns the leprechaun’s “Cousin of the Night” and says “They are usually pleasantly inebriated and may be seen riding on the backs of sheep or the family dog, as they careen away from their latest drinking spot.” Mystic Investigations said in its Paranormal Activity Watch that Clurichauns “look like drunken demons with a sinister smile on their face.” Whereas Mystical Myth says Clurichauns are “impeccably dressed and well-groomed.” Kitty the Dreamer says clurichauns prefer to wear red instead of green and they protect wine cellars instead of pots of gold. 2. How to Tell the Difference Between Wood Sorrel and Clover. Like leprechauns, the shamrock is another symbol associated with Ireland and St. Patrick’s Day. Shamrocks are three leaf clovers. Legend says that St. Patrick used the shamrock to teach about the Christian Holy Trinity. The easiest way to tell a true shamrock clover from wood sorrel is that wood sorrel has heart-shaped leaves and clover does not. Clover leaves are oval. Click here for great pics comparing the two. 3. How to Make (Easy & Tasty) Corned Beef & Cabbage. Cover the beef brisket with water, bring it to a boil and simmer it for approx. 2 hours (until tender). After about an hour and a half, add carrots and the small red potatoes whole. Simmer until almost done (when vegetables are also tender). Cut the cabbage into eight pieces. Put the cabbage on top of everything else in the pot and cook it for another 15 minutes. Slice meat across the grain. Serve with rye bread, mustard, and the white cream sauce below (not traditionally Irish, but my favorite). Melt butter. Turn the flame off and stir in flour, slowly, until smooth. Pour milk in slowly, maintaining smooth consistency. Add seasonings to taste, bring to boil, turn down to simmer, and cook until it thickens. 4. How to Make Green Beer. Of all the things I’m listing, this one’s the most difficult. Are you ready? 5. A Few Irish Toasts. How about you? Are you Irish? Do you celebrate St. Patrick’s Day? What are your plans? Have you had corned beef and cabbage? Do you even like it?!? WHATEVER YOUR PLANS ARE FOR THIS WEEKEND, HAVE FUN!